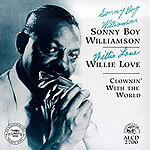 CD reviews: "The Essential Sonny Boy Williamson" and "Clownin' With the World"
These reviews first appeared in the September 10, 1993 issue of the North County Blade-Citizen (now North County Times). These two releases are both drawn from his most roductive recording years, from the 1950s through the early '60s. 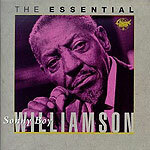 The Alligator set is a reissue of sides Williamson recorded for the small Trumpet label; the MCA two-disc set is taken from the Chess Records vaults. Both are representative of Williamsonson's best work, displaying his impressive combination of world-weary vocals and searing harmonica solos. The MCA set contains an informative and well-written booklet that makes reference to additional Trumpet recordings not on the Alligator release  offering the promise of future releases from the Trumpet series.